If you have any special dietary requirements, please speak to Lysses House Hotel beforehand. Chakana was founded in 2002 by the Pelizzatti family, which was something of a return to wine-making for the family whose ancestors had made wines in the wine-growing region of Valtellina in Italy in the 19th Century. The Chakana winery is located Agrelo, Mendoza and since 2002 the estate has grown to cover some 150 hectares with 120 hectares under vine which includes their own vineyards in other areas of Mendoza: 21 hectares in Mayor Drummond (Lujan de Cuyo) and two vineyards comprising 51 hectares in Altamira (Valle de Uco). In 2012 Chakana began the process of converting all of their vineyards, farming and viticultural methods over to organically / biodynamically certified. The wine-making style is based on minimal intervention with minimal use of sulphur or other additives and only indigenous yeasts. Chakana is the only Argentinian winery GMO-free certified by the Non-GMO Project. First of all, a big thank to Gabriel Bloise and Matt Nutt from J E Fells for coming to host the Chakana Winemaker’s dinner. I think it was a great success. Gabriel has been the winemaker at Chakana since 2006, so I think it is safe to say he know the winery, vineyards and wines inside out and he was most informative. Chakana practises both organic and biodynamic viticulture, although not all of their wines can be classified as such due to various reasons, although a lot of the wines are. It was interesting to hear Gabriel explain that, due to the fact the they are allowed to irrigate their vines, it negates a lot of pressure from vintage variation. Having said that, it was interesting to try the Chakana Estate Selection 2016. The grapes for this wine are from cooler vineyards at 1100 elevation and 2016 was the coldest vintage for 56 years, so it was a really unusual vintage. This has resulted in an fine, lighter style of wine with amazing florals, pure fruit and refreshing acidity. It would seem that Chakana and Gabriel have set out to make fresher, pure styles of wine with good (natural) acidity. These are the big, jammy and overly spicy Argentinean wines of yesteryear. The biggest surprise, for me, was that the best selling wine on the evening was the Chakana Estate Selection Chardonnay 2014, it was packed full of tropical fruit with a touch buttery character, but I think the fact that it matched the Pumpkin and sage Ravioloni pasta so perfectly really sold it. Of the two wines served with the lamb, the Estate Selection Red Blend was the surprise of the two – it worked extremely well. Again Lysses House Hotel excelled with the food. Chakana Torrontes 2017 – from Salta. Quite crisp and dry, a little bit grapey, hints of ginger. Fresh. Chakana Estate Bonarda 2015 – there were two bottles used and they were quite different. I think I had the better of the two. Dry and spice, red berry fruit, floral notes and plums on the nose with more spice and jammy red fruit on the palate. Balsamic / minty notes, a touch of sweetness and supply tannins. Chakana Estate Syrah 2014 – dry and spicy. Quite full but mellow and spicy. White pepper. Sweetish on the palate, not too fruity. Chakana Estate Selection Malbec 2016 – Loads of floral / violet aromas, hints of spice and a little cacao. The palate was soft, full with silky tannins and an amazingly fresh acidity. Chakana Estate Selection Chardonnay 2014 – Quite dark golden colour. Fruity nose, hints of anise, peach and a touch of oak. More tropical, pineapple and apricot flavours on the palate, a hint of spice and a little buttery character. 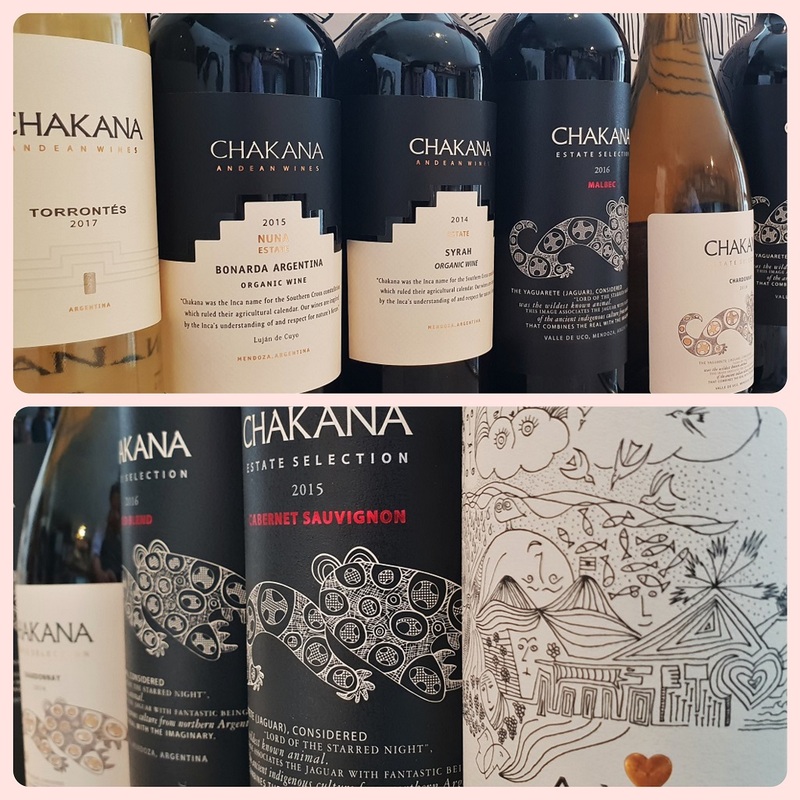 Chakana Estate Selection Red Blend 2016 – Dark black and red fruit. Reminiscent of a Bordeaux on the nose. Firm tannins and a good structure with nice acidity. Chakana Ayni Malbec 2015 – A single vineyard wine (Gabriel’s favourite) from relatively young vines, the first vintage was 2011. This wine is aged in large oak foudres. It has herbal and floral aromas with hints of violets, spices and dried cherries. It is supple, elegant yet quite rich and complex with a drying finish. Superb.